The Witcher 3: Wild Hunt’s second expansion, Blood and Wine, gives you a lot of quests to undertake. The difference between it and most other open-world games, though, is that almost all of them are worthwhile. 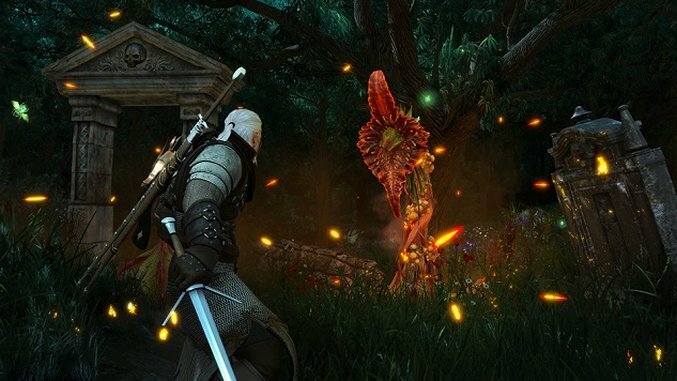 The Witcher 3 as a whole loves to turn every menial task you perform into a story worth hearing, and that’s what lets anyone get lost in the immense world it creates: not because you’re trying to level up or want the sword you’ll get at the end, but because you genuinely want to see what happens next. Blood and Wine is better than most full-featured games I’ve played this year. In case you’re tempted to skip it in favor of some of the other big games that have come out the last couple of months, here are ten short stories to help convince you to go back and visit the world of The Witcher 3 one last time. I hated most of the “Fists of Fury” quests in Wild Hunt, but Blood and Wine’s iteration of this quest is a lot more interesting. Instead of simply fist-fighting a bunch of strongmen, you fight one of them, must counter three hits from the second, then insult-swordfight the third, and fight your final opponent drunk. It won’t rank among the greatest quests in all of The Witcher 3, but it manages to be more entertaining than it should be, given that these quests have been awful in the past. This could have been a simple “here’s a new layer of upgrades!” quest that introduces you to mutations, which give you new perks to choose from and unlock more slots to place your upgrades in. But no, it has to go and get all tragic; the way you unlock more powerful mutations is by using the research of a man who was trying to cure his son of them. The quest goes to great lengths to let you know you’re using another man’s tragedy to your benefit, which makes the subsequent tutorial on how powerful the new mutations are feel a bit tone-deaf. Still, it’s a quest worth doing even if you don’t care about making your character stronger, and shows how much effort Blood and Wine puts into contextualizing all of its elements. Another quest I could just as easily see being an episode of a Witcher TV series, “Portrait of a Witcher as an Old Man” has some strong comedic chops and gives you nice little souvenir for your troubles. A painter catches sight of Geralt, admires his features, and wants to paint him. After looking for a location and finding his lost paint, you get to choose a pose for Geralt to take: on horseback, standing firm, or lying down. No matter what you choose, Geralt ends up naked, and the painting costs 1000 Crowns (which is a lot). It’s a nice break from all the serious curse-lifting you have to do elsewhere, and the quest is worth it to hear the painter go on about how his cat can not only paint, but is actually a hack. “Goodness Gracious, Great Balls of Granite!” is about what you think it is: a pair of stones have gone missing from the crotch of a statue said to grant sexual virility. People cherish the statue because rubbing the stones seems to make them better in bed. The quest has a couple of great moments (such as waiting for the thief to finishing using them), but the best part of the quest is when the caretaker of the statue begins telling you what’s going on while the camera angle has him blocking your view of the stones. At first you might think it’s to maintain an M rating, but then he moves his head, revealing the forsaken statue’s front-hole. An early part of the main questline, “The Best of Toussaint” has you figuring out the identity of a killer. That’s secondary to what makes the quest great, though; while figuring out who the killer is, you’re asked to break up a palace-wide scavenger hunt and ruin people’s fun in order to learn the location of the next victim. Seeing Geralt try to lure a “unicorn” (a horse with a horn tied to its head) using an apple, stealing a prize from someone’s hand then smashing it on the docks to find the clue inside, and then not put all the clues together at the end is the kind of silly-but-believable hijinks that make some of the more low-key quests in Blood and Wine so good. This might be a quest where, like me, you’ll be tempted to see how every choice you can make pans out. A man wants to lift the curse from a woman bound as a tree, and knows how the curse works because of the storybook myths he grew up reading as a child. He directs you to a witch in a cabin in the woods, and you’re forced to choose whether to force her to help you. No matter what you choose, you get the bad ending; either Geralt lifts the curse himself and turns the woman into a wraith, or the witch does. If you have the witch do it, the wraith kills the man who wanted to free her. Long story short, I chose the one where the man who tasked me with lifting the curse hates me for being incompetent, but is still alive. I know how much worse the whole thing could have gone for him, but he never will. That’s the weight of being a Witcher, I suppose. What I love about this quest is that its structure conveys its message. You probably won’t know you’re trying to prove you possess the five virtues necessary to draw a magic sword from a lake until you’ve demonstrated about half of them. After a chance meeting with a hermit at said lake, you realize you were being tested for the sword since you got to Toussaint, the new area in Blood and Wine. Even after you meet with the hermit, the quest objectives say “wait for a chance to prove your wisdom.” It circumvents the old “prove yourself” videogame trope by saying that you can’t treat good deeds like currency, revealed only when required and for a reward. There’s also a nice “walk on water” joke in there for good measure. “Paperchase” is remarkable for what it is not; another monster quest featuring another bumbling fool who got himself in too deep with a curse and now needs ol’ Geralt to help him out. Instead, “Paperchase” makes Geralt the fool after a messenger tells him he has a ton of gold in a bank he hasn’t used. At the bank, Geralt is told he’s dead and needs a bunch of forms to claim his cash. The tellers bus him around, no one’s willing to be straight with him, and at the end you find out you spent twenty minutes trying to claim a measly 500 Crowns. I could have gone and killed a bunch of bandits and gotten more for my time. “La Cage Au Fou” demonstrates how deft The Witcher 3 is at pivoting its main questlines into strong tangents. As you’re chasing the killer from “The Beast of Toussaint,” you find out the only way to track him is to brew a potion made partially from the saliva of a Wight. The quest then goes from “go collect this thing” to Twilight Zone episode in a matter of minutes. There’s a powerful scene mid-quest where Geralt has to convince the Wight he’s here to help it, and then promptly sits down to eat dinner with it (trust me, it makes sense). For about a half-hour, you forget the whole point was to collect some macguffin for another quest and get lost in the mystery of a creepy house littered with spoons, making the quest its own but also tying it into the larger narrative of Blood and Wine. It’s such a strong showcase for how The Witcher refuses to phone anything in that it’d be one of the first quests I’d show someone who wanted to know why they should play The Witcher 3. “The Warble of a Smitten Knight” takes a while to get to its twist, but it’s a good one. Initially, young knight Guillaume de Launfal tasks you with winning a contest to get the attention of Vivienne, whom Guillaume has a crush on. Guillaume also suspects Vivienne is cursed and wants to save her, and he’s right. What he hasn’t thought about, though, is that Vivienne wants nothing to do with him, and even after Geralt manages to help Vivienne lift the curse that haunts her, she tells Guillaume that if he really wants to help to leave her alone. Geralt agrees, saying “You helped her. That doesn’t mean she owes you her love.” A lesson to take to heart. Suriel Vazquez is a freelance writer who’s not even done with Blood and Wine, so there could very well be more quests worth mentioning. He’s written for Paste, ZAM, Glixel, and several others. You can follow him on Twitter.